Connecto is an add-on tool to your website which helps you to improve visitors engagement and hence conversions from your on site traffic. It can be very simply integrated to your site in just 5 minutes. Simply go to registration page and enter your websites details, activate your account and done! Else, simply ask us by mailing at support.connecto.io. Once your account has been created, you will receive your JS snippet in your mail. You can also get the same snippet from your profile page after logging in to your account. You need to put Connecto’s JS snippet on all the pages where you want to show a lead form using Connecto. For integrating our snippet, you need to ask someone from your tech team to place it somewhere in the footer or right below your Google analytics snippet. This is all the integration and tech support your need while integrating Connecto on your site. Isn’t it really simple? Connecto gives you direct integration to any custom CRM like like Zoho, Mailchimp etc. If you are using any other CRM having an API, please ask our support team (at support@connecto.io) and we will integrate it for you. 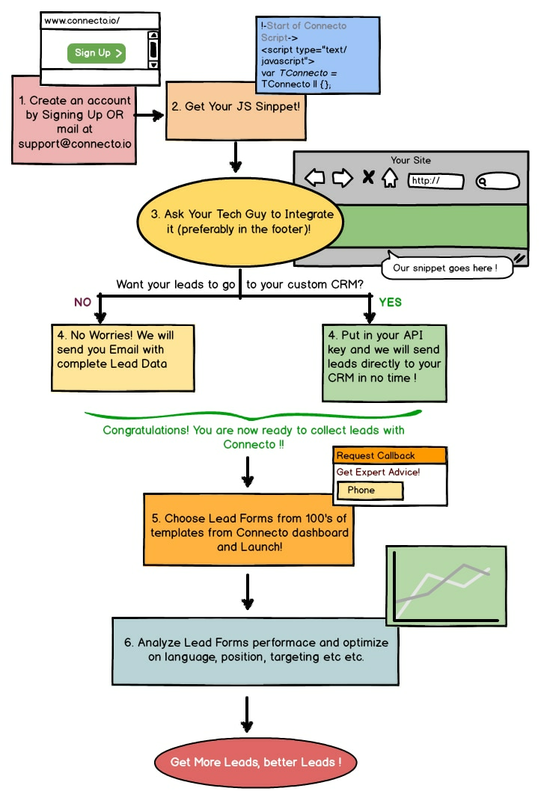 Thus, any leads generated from Connect’s lead form directly goes to your CRM in no time. Once you are done with all the integrations, you can go to Connecto dashboard and choose your lead form style from 100’s of our beautiful template forms. There are many targeting options available and you can read about basic targeting variables here. We work very closely with all of our customers and any query is entertained within 2-3 hours. Feel free to ask! With Connecto’s A/B Testing, you can choose how and when to show your forms such that you get maximum quality fill rate. You can A/B test on variables like look and feel, targeting parameters, positions, etc and choose the best performing lead form.